This article is about the position of Prime Minister of Hungary. For individual Hungarian prime ministers, see List of Prime Ministers of Hungary. The Prime Minister of Hungary (Hungarian: miniszterelnök) is the head of government in Hungary. The Prime Minister and the Cabinet are collectively accountable for their policies and actions to the Parliament, to their political party and ultimately to the electorate. The current holder of the office is Viktor Orbán, leader of the Fidesz – Hungarian Civic Alliance, who has served since 29 May 2010. According to the Hungarian Constitution, the President of Hungary is required to nominate the leader of the political party who wins a majority of seats in the National Assembly of Hungary as Prime Minister. If there is no party with a majority, the President holds an audience with the leaders of all parties represented in the Assembly and nominates the person who is most likely to command a majority in the Assembly, who is then formally elected by a simple majority of the Assembly. In practice, the leader of the party winning a plurality of votes in the elections is usually named Prime Minister. The Prime Minister has a leading role in the executive branch in accordance with the Hungarian Constitution. The Prime Minister selects Cabinet ministers and has the exclusive right to dismiss them. Cabinet nominees appear before one or more parliamentary committees in consultative open hearings. They must then survive a vote by Parliament and be formally approved by the President. The title of Hungary's head of government in Hungarian is miniszterelnök. Literally translated, this means "Minister-President". However, since "Prime minister" or "premier" is the more usual title in a parliamentary system for a head of government in English-speaking nations, the title is translated as "Prime Minister" by most English sources. The palatine (Latin: comes palatii, comes palatinus, later palatinus (regni), Hungarian: nádorispán/ nádor, Slovak: nádvorný župan/ nádvorný špán, later: palatín / nádvorník, German: Palatin) was the highest dignitary in the Kingdom of Hungary after the king (a kind of powerful Prime Minister and supreme judge) from the kingdom's rise up to 1848/1918. Initially, he was in fact the representative of the king, later the vice-regent (viceroy). In the early centuries of the kingdom, he was appointed by the king, later elected by the Diet of the Kingdom of Hungary. After the Habsburgs solidified their hold of Hungary, the dignity became an appointed position once again. Finally, it became hereditary in a cadet (junior) branch of the Habsburg dynasty after King Francis appointed his brother Joseph. During the Hungarian Revolution of 1848 the revolutionaries wanted the creation of a Hungarian cabinet which would be independent from the Austrian Empire and the Buda Chancellery (which was office of the Imperial Governor-General). One of the 12 points said: 2. A responsible government in Buda-Pest. Ferdinand V appointed Count Lajos Batthyány for the position of Prime Minister of Hungary on 17 March 1848. The government was called ministry, differently from the current acceptation. The ministries were called departments. 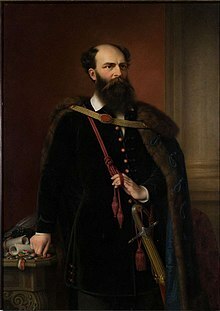 Batthyány resigned on October 2, 1848 he was succeeded by Lajos Kossuth as President of the Committee of National Defence. This executive body has not been allocated the portfolios. In April 1849, when the Hungarians had won many successes, after sounding the army, Kossuth issued the celebrated Hungarian Declaration of Independence. In May Bertalan Szemere was appointed Prime Minister. The position was vacant after the defeat of the freedom fight. As of April 2019, 5 former Prime Ministers of Hungary are alive. Viktor Orbán, who served as Prime Minister from 1998 to 2002, is currently serving and thus is not included on this list. ^ "2011. évi CCII. törvény Magyarország címerének és zászlajának használatáról, valamint állami kitüntetéseiről" [Act CCII of 2011 on the Use of the Coat of Arms and Flag of Hungary and on State Awards]. CompLex Hatályos Jogszabályok Gyűjteménye (in Hungarian). Retrieved 21 February 2017. ^ "How much cost is the PM's work? And others? 2,14 million HUF per month, annually 25,68 million.(Hungarian)". Retrieved 10 March 2018. ^ "Members of the Government". Retrieved 10 March 2018. ^ "The Fundamental Law of Hungary (English)" (PDF). Hungarian State. Retrieved 8 May 2017. Wikimedia Commons has media related to Prime ministers of Hungary.